What It Is:A stylish yet functional bamboo bath caddy from Umbra. 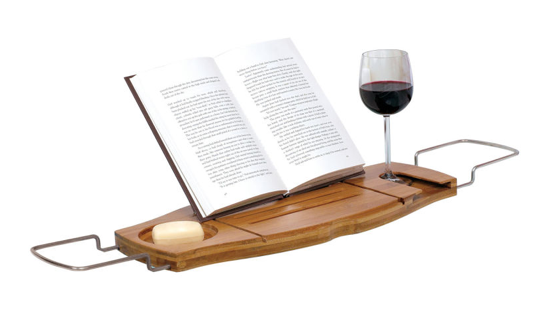 With a sturdy spot to slide in a glass of wine and a foldable book rest, you can slip away for hours while soaking up the suds in the tub. An additional holder can be used for your bar of soap (it has drainholes to the tub below) or even for a candle to really set the mood. Where It’s At: Umbra online and at fine home furnishing stores. Since I think this would make such a great Mother’s Day gift, how about a bonus entry into my Mom’s Day Palais des Thes giveaway? Tell me in the comments below: would you love to indulge in this bathtime accoutrement? I like the idea but seems a bit expensive – I’m going to see if my husband can make me something similar. I tend to prefer to take showers, but if I did use the bathtub, I think this could be handy. As I am a bath person, I’d love to indulge in this set! Oh, I would LOVE to indulge in this! How fun to have this in my bathtub! I have a bath almost every night and I would love this! Nope, it’s not my style. great idea, but its not for me! I’m just in and out – well mostly I just prefer showers! I am a shower person but my mom loves baths and this would be a great gift for her! I probably wouldn’t use it because I tend to shower, however, my mom would certainly use it. Palais des Thes bonus entry: I would love to indulge in this bathtime accoutrement unfortunately I can’t afford to pay for all the water in the tub! I probably wouldn’t – I prefer showers to baths. of course i’d love to indulge! I love to indulge in this bathtime accoutrements, anytime!!! I love this! To be able to read in the tub & drink wine is a great idea. I love this invention!! It would be perfect for relaxing!